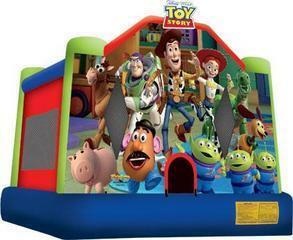 The Toy Story Moon Bounce is a large 15 x 15 moon bounce featuring all of your child's favorite licensed characters. Woody, Bullseye, Jessie, Buzz, Hamm, Rex and Slinky. It also features the aliens in beautifully bright artwork from the movie. This adorable bouncer is a sure crowd pleaser that will wow your child and guests. Please make sure you have enough room for the unit to fit in the spot where you would like it. We would be more than willing to come and perform a site survey. Manufacturer limits are 8 participants and 1000 lbs.